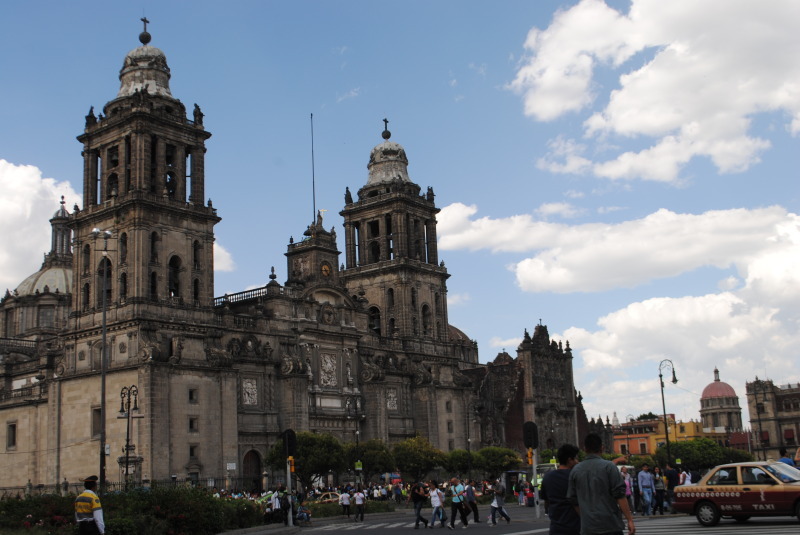 Today, Mexico City is a major capital, bustling with life and adventure. Some of the tallest buildings in Latin America are found here, and the headquarters of thousands of major multinationals are located inside this active capital. But let’s go back in time for a bit. Imagine walking around the desert for years and years, searching for a place your gods told you was going to be your home. The sign you’re looking for is an eagle eating a snake, perched on a cactus. And when you find it, after ages of searching, it’s in the middle of a lake on a tiny, barely habitable island, surrounded on all sides by groups of people who don’t exactly like you. That’s what life as one of the first Aztec settlers in Tenochtitlan was like. Did I mention the active volcanoes and earthquakes, and torrential rains? Of course, patience pays off. And the Aztecs were smart. They built a city on the water, grew food on floating gardens – some of which are still in active use, and eventually built an empire that conquered everyone around the lake, and most of modern central Mexico. And then the Spanish came. By the time the conquistadors arrived, the city was huge. Nearly 1 million inhabitants lived in Tenochtitlan, which by that point had drained most of the lake, turned its free-flowing waters into controlled rivers, and created massive stone pyramids, plazas, marketplaces, and dwellings. The Spanish built churches on top of old temples, enslaved the population, and turned Mexico into a moneymaking colony. Hundreds of years later, the Mexicans won their independence, took over much of what is now the western US, and eventually lost a war against the United States that resulted in a loss of 1/3 of the national territory. Every moment of that wild history is present, palpable, and a part of modern Mexico. Parts of Mexico City feel as though they’re trapped in colonial times. Ruins from the pre-Colombian era appear on random street corners, and languages blend together to create a rich culture that is unique unto itself. The modern metropolis of Mexico City boasts an informal population of roughly 23 million in the metro area, with a formal population of 8.851 million. And it practically grew overnight. In the 1950’s, what was left of the formerly bustling Tenochtitlan had a population of roughly 500,000. It’s one of the most prominent cultural capitals in the Americas, offers incredible cuisine and more museums per capita than any other city in the world, and a wild mix of architectural styles, political perspectives, parks, and entertainment. Needless to say, there’s a wild mix of personalities, cultures, family histories, and neighborhoods here. Being from ‘el DF’ (Federal District of Mexico) you aren’t Mexican. You’re Chilango. There are three things I’ve never seen in el DF – a burro, a sombrero that wasn’t on sale in a tourist shop, or a taco that looks anything like American fast food. Traditional Mexican sweets for sale in a shop in Mexico City’s Zocalo. Mexico City is not walkable. You need to take the subway, drive, or take a taxi (preferably with the help of TaxiAviso or a similar app) to get around. Free bike options are available in certain parts of the city, too. In fact, despite it’s non-pedestrian focus, the city is a pioneer in many green technologies, and working hard to combat pollution. Don’t overdo it at first, though – this is high altitude. Sure, Mexico City is in a valley, but it’s also an average of 7,382 feet above sea level, with many parts much higher, such as Picacho Ajusco or La Sierra de la Estrella. The air pollution is drastically better than in the 1970s, when birds dropped dead from the sky, and the city’s Green Plan has turned a barren urban landscape into a green and vibrant city in just a few years. Like most major cities, Mexico City has its rough spots. For the most part, however, it’s a bustling hub of business activity, culture, and adventure. I’ve spent a lot of time here, and the following are what I’ve found to be some of the best places to relax, enjoy, and get to know Mexico City. Before you get started on this little trek, let me clarify one thing. The danger here has been overhyped. I’ve lived in the city for about three years, and never experienced a problem. Sure, it’s a city – that comes with a set of expected problems – but it’s not the danger zone that it was in the 1990s. Mexico City is a relatively safe place. Wondering how to travel safely in Mexico City? Here’s my biggest tip: Remember that it’s a city, and act accordingly. It’s that simple. 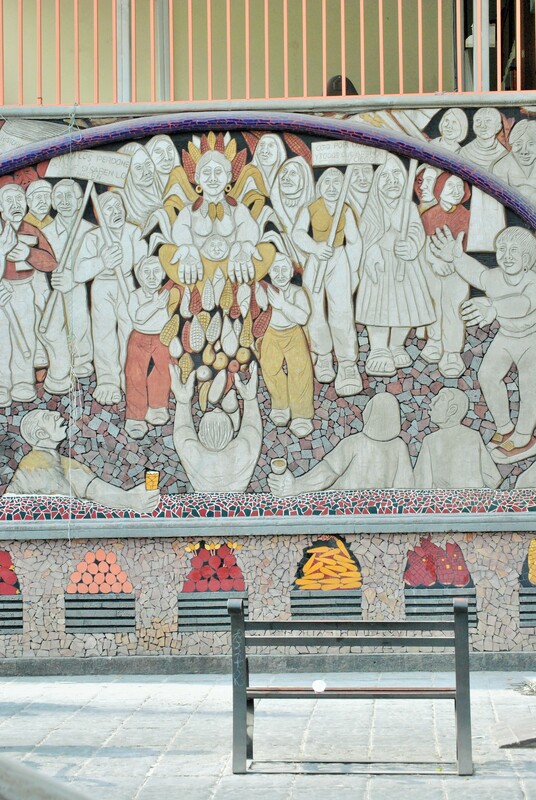 Mexico City’s markets provide a taste of culture and an unexpected art venue. New York City has Central Park, and Mexico City has Chapultepec. This park is one of the largest in the Western hemisphere, measuring over 1695 acres. Originally a retreat for the ruling Aztec elite, it’s been a park for more than 500 years. The Mexican presidential residence is located here, as is the castle that held the ill-fated Mexican Emperor Maximilian and his wife. 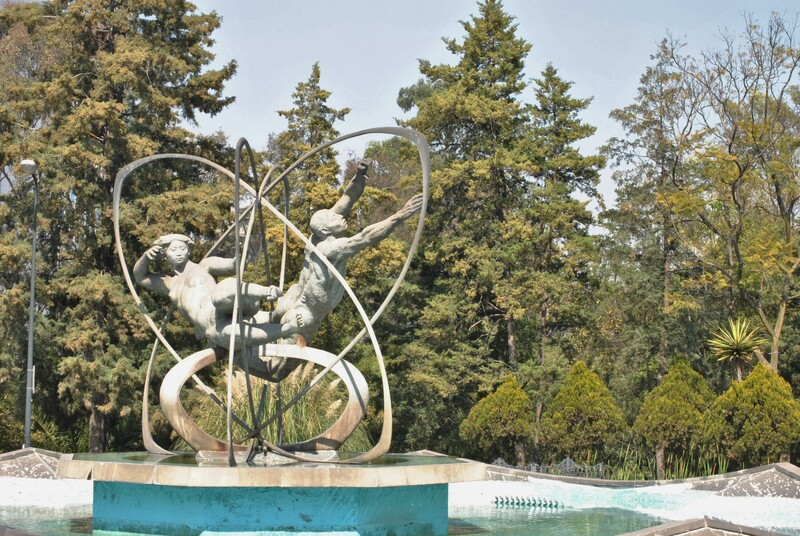 Chapultepec’s other features include two lakes, a zoo, the National Museum of Anthropology (one of the best spots to spend a day or three), the Rufino Tamayo museum, an amusement park, a children’s museum, a technology museum, murals by Diego Rivera….should I go on? Historically important for its role as a pre-Columbian park, the residence of presidents, emperors, and Aztec kings, and its role in the Mexican-American War, this is one place you could spend years exploring before exhausting all the sites. A Fountain in Chapultepec Forest. The name of Mexico’s main downtown area is El Zocalo. It’s within this grid-patterned hive of colonial architecture and one way traffic that you’ll find a living example of how pre-Columbian customs adapted to colonialism. Official government buildings take the place of their Aztec predecessors, the main Catholic basilica is set atop the old Aztec temple (an active archeological site at present), and pre-Colombian marketplaces called tianguis still operate, but selling wares made in modern factories around the globe instead of regional goods and produce. 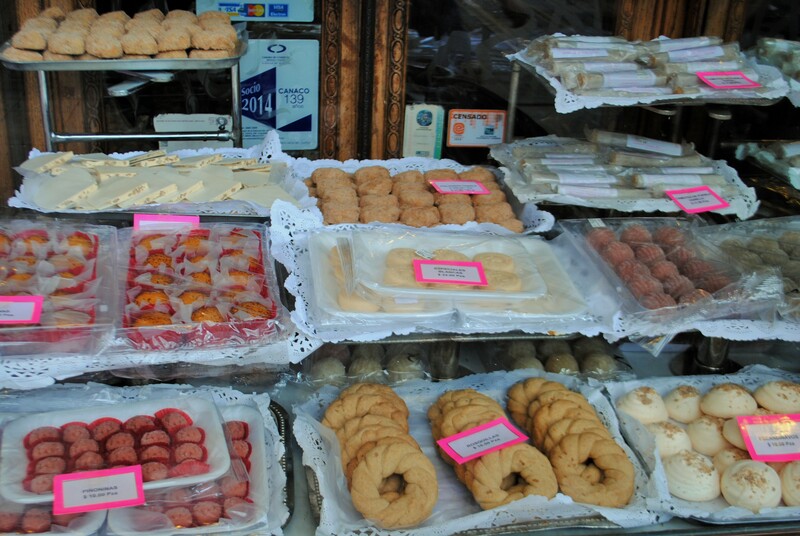 Tucked away on one of the streets here, you’ll find a sweet shop selling traditional Mexican candies with recipes that are over 100 years old. I’ve been there. It’s dangerously tempting…beware that Mexican sweets tend to be tooth-gratingly sugary (making them perfect for easing your mouth after a spicy hot meal, or alongside a cup of fresh-brewed espresso). You’ll find numerous museums (torture, the inquisition, economy, art, and many more), bakeries, shops, and tourist attractions, including the national Palace of Arts (Palacio de Bellas Artes), the original campus of the national university, and even a few performers reenacting their closest approximations of traditional dances that were lost under colonial rule. One thing’s for sure – the excitement here is nonstop. Set atop the ruins of an Aztec temple, the basilica in Mexico City, this church is the sight of active archeological investigations. Named a World Heritage Site, this massive campus is the size of many cities. With more than 350,000 students, it has to be. UNAM, the National University of Mexico, is autonomous and receives the same funding from the Mexican government as many of the country’s states. UNAM’s main campus was primarily constructed in the 1960s, and the university’s stadium hosted some of the Olympic Games in 1968. The campus itself is spotted with murals and mosaics by famous artists, sculptures, and architects, is home to numerous theaters and museums, an outdoor sculpture space, and miles of relaxed biking trails. The only way to get bored here is if you’re stuck in traffic. Just watch out for scorpions – the university also includes an ecological reserve that is closed to the public. Possums, small mammals, snakes, scorpions, migratory birds, lizards, and other wildlife are commonly sighted on campus as a result. I’ve walked the campus hundreds of times, but I still don’t think I’ve seen it all. A friend of mine who has taught here for over 25 years is still discovering new things each time she’s on campus. 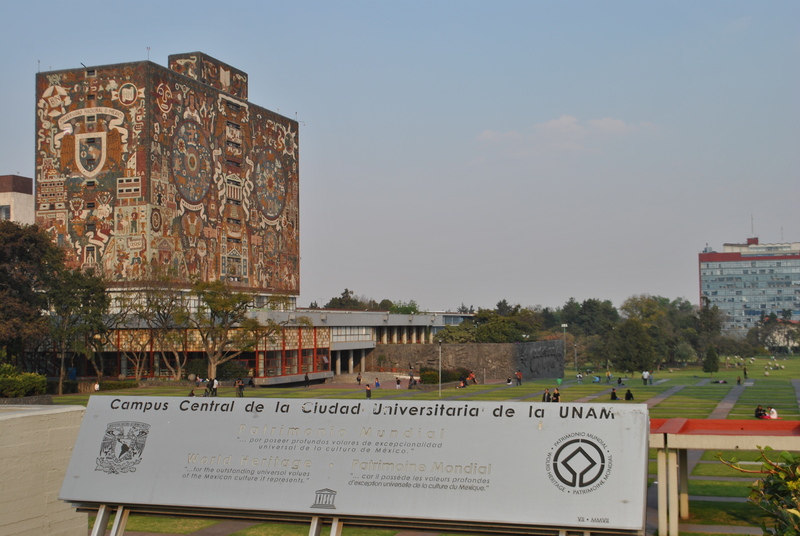 The main campus of Mexico’s National Autonomous University is a UNESCO World Heritage Site. Before the Spanish arrived, the Aztecs served a soup called pozole at celebrations. The soup wasn’t just any soup, however. Although it’s made with pork, chicken, or a mix of both today, the original meat was man (my husband hotly contests this, but the archeological record is pretty clear…). Luckily, losing teams don’t give their lives after a ball game today, and pozole still exists, served as a popular dish on special occasions, but also as a filling meal pretty much any day. Potzolcalli specializes in this filling dish. Add a little oregano, lime, cilantro, fresh onion, or radish to taste, and enjoy. It’s a much safer twist on an ancient meal – and one you’ll find yourself craving, despite its origins. With two locations in the heart of historic Coyoacan, you can order the Mexican fried pastry called churros, try Mexican hot chocolate (cinnamon makes a world of difference), fresh-made ice creams, and a number of other tasty treats at this dessert chain, and enjoy them while you walk past the old house of Hernan Cortez. If conquistadors aren’t your thing, take your ice cream to the local art market, one of the churches on the main plaza, or learn about the history of La Conchita while trying your first stuffed churro. Coyoacan is one of the most popular areas for foreign visitors, and offers a window into the folkloric side of Mexico that many foreign visitors crave. There are several parks in the main part of this neighborhood, and you’ll find history plaques and self-guided smartphone tour posters on many of the neighborhoods’ historic corners. Hop a trolley while sipping your hot chocolate, and learn all about Coyoacan’s origins, the lives of Frida Kahlo and Diego Rivera, and the numerous historic tragedies and triumphs that took place here. From a cursed plaza to a fountain that commemorates this part of town’s history as the wild outskirts where coyotes once roamed the streets, a convent that played a key role in the Mexican-American war (and still has a few canons out front), I love exploring this part of town, and keep stumbling across new adventures. You’re sure to do the same. Although this restaurant has several location in Mexico City, there’s only one that’s a must-visit in my book. Located in el Bosque de Chapultepec (Chapultepec Park or Forest), Restaurante Meridiem has an excellent view of the park’s most popular lake, and offers a fine dining menu in a refreshing atmosphere. Enjoy a day in the park, hop into a paddle boat or go for a run, visit the area museums, and then stop here to let yourself recharge a bit. Good news for you – Mexican fine dining is usually priced about the same as a meal at a mid-range restaurant in the US. Meridiem is no exception. We’re only touching the tip of the proverbial iceberg in this article – Mexico’s capital is constantly changing, and like New York, Moscow, or any other megacity, it offers too much to do in a few short days. For history buffs, culture lovers, and fans of art, architecture, and music, this city (chaos and all) is a heavenly retreat.